Anyone that knows me knows… I have opinions. On everything from organic cat food to global warming. I also have an opinion on the what I call: the dreaded tea ball. Often times people will ask me this question: “What should I use to brew my tea in?” First of all, if you read my post on “To Steep or To Brew?” you would know that the word “brew” is like nails on a chalkboard to me. 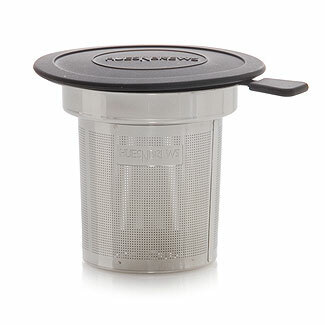 So I answer like this: “What I like to use to STEEP my tea is…” and I share my opinion. So what do I like to use? Certainly NOT the dreaded tea ball. I’m sure it came in handy during Victorian times and like, the 80s, but it’s 2008, TeaPeeps, we need to retire the ball. It doesn’t do the leaf justice. Leaves need room to stretch out and “breath.” The ball is too restrictive. Plus, its messy. What I love are tea pots with built-in infusers (I will be blogging about this in a few days). 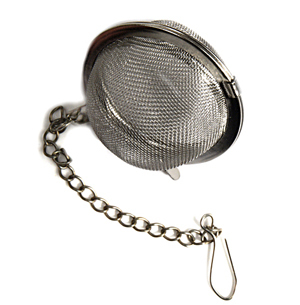 I also like our Universal Tea Infuser. Love it. Have more than one. I also like the glass tea pot called Bora Bora by Bodum. And not just because it just happens to match the name of our super fabulous Bora Bora Green tea with passion fruit. Pure coincidence. Lastly, I really like our HuesNBrews tea pots. These pots work. Are easy on the eyes. Easy clean up. I’m partial to sunflower this year. I also really really love our tea pillow cases. That’s what I call them. I’m not a fan of the “tea sock”. Others love it. Not me. I don’t like that it hangs over the side of the cup. Don’t like that tea can sneak out. Yep.. the pillow case gets my vote. I also LOVE that I can make my own tea bags and bring them with me. I never leave home without tea. Seriously. I have special tea carry case. Does that make me a tea nerd? Absolutely. But at least I’m drinking some darn good tea and not something of lower quality. What to do with your old tea ball? Honor it. Frame it. Hang it on your Christmas tree. Glue it to a pedestal, but please, retire the dreaded tea ball. Do you have an opinion on the dreaded tea ball? I’d like to hear about it. If you liked this post, pass it on to a friend!